Once I get organized, I will post an entire gallery of photos from my trip to Mt. 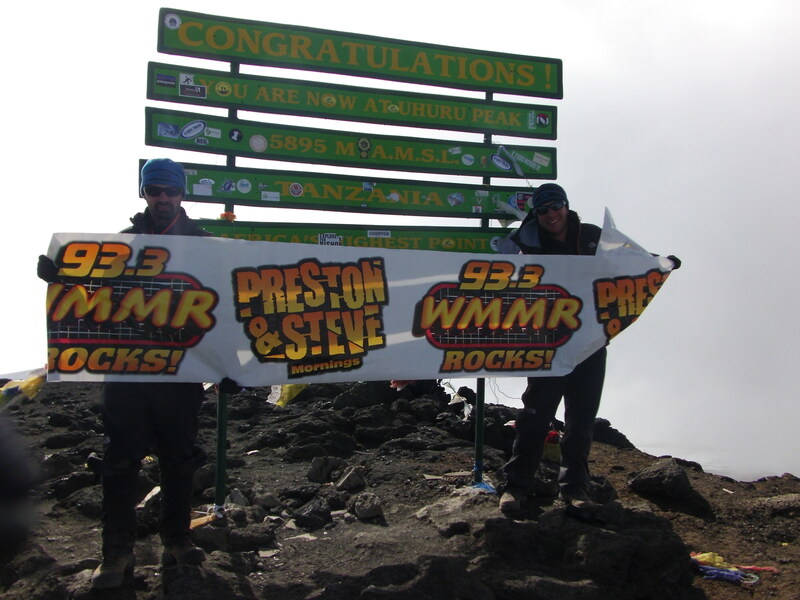 Kilimanjaro, but here are two WMMR and Preston & Steve related pictures. More to come soon! Today, we began in earnest the descent off the mountain. It will take two days, although we could probably do it in one. Everyone feels good, although I think we’re all ready to leave Kilimanjaro, get a shower, sleep in a real bed, and maybe even have a beer or two. Carl and I looked into advancing further, but that would require additional transportation and hotel costs and the rest of the group was content to stay in Mweka Camp, on the mountain, for one more night. The path down from Base Camp at Barafu was not difficult, but about 1/3 of the way into our trek, the sun disappeared and the rain began. Earlier in the trip, we had to deal with brief showers and even a little sleet, but this is by far the worst weather we’ve had – a soaking and constant rain. It’s odd, too, because at this time of the year, rain is supposed to be infrequent. So our clothes and packs are wet, but we know that in less than 24 hours, we’ll be at KIA Lodge, where we can relax and get dry and warm. Regardless, we’re here for the night, off of the Alpine desert and moorland and back into the beauty of the heather. Tomorrow morning, shortly after leaving Mweka, which sits at just under 10,000 feet, we’ll be back into the rain forest and will follow Mweka Route until we reach the gate, where transportation will take us back into civilization. The weather, fatigue, and my general disgusting state of grime, filth, sweat, and body odor have rendered me a little impatient. I smell BAD. But hey, I’m in Africa, so who cares? It really has been an amazing journey thus far. Three words: I did it. It was the most exhausting, draining, longest and most difficult thing I’ve ever done, but I made it to the summit of Mount Kilimanjaro! Moreover, everyone in our party made it, too. Quite the accomplishment, especially considering that Cathy was dealing with some serious altitude sickness and Regan was having a lot of difficulty breathing. We left Base Camp at Barafu at 6:40am, and leaving at dawn instead of at midnight proved to be the right decision. Our guide, Godlove, suggested afterwards that Cathy and Regan probably wouldn’t have made it to the summit if they had to hike in the cold and the dark; it just would have been too much for them. The hike itself was supposed to take 6 to 7 hours, meaning we would reach the summit sometime in between noon and 2pm. Instead, it took 9 hours. We went VERY slowly because we had to. Each step was difficult. Base Camp is at about 15,000 feet and the summit is at 19,340. I would guess that at least 3,500 of those feet on the way up were at a very steep angle. So we would go a little bit at a time, one foot in front of the other, constantly trying to catch our breath, knowing that we never would. The air is very thin and your body knows it’s not supposed to be doing this. I never really thought about giving up, though, because I knew it would just take time. Fortunately, I never experienced any altitude sickness, never got a headache, and didn’t have to cope with any injuries. My only physical ailment is that my right knee hurts from the pounding on the descent. Back to the climb itself: when I write that it was slow going, I mean that it was SLOOOOWWW going. Our guides kept encouraging us, though, and allowed for many breaks on the way. Those breaks were entirely necessary, and during the brief respites, I would almost be able to catch my breath and feel slightly normal. The moment we resumed hiking, I was immediately out of breath again. One foot in front of the other, one small step at a time, we continued higher and higher. The main goal was to make it to Stella’s Point, which is above 18,000 feet and from there, you can see the summit. After 8 hours of slowly trudging forward and upward, we made it, and immediately we knew the summit was within reach. The ascent from Stella’s Point to the peak at Uhuru is much more gradual, but at that altitude, we still had to climb gradually and cautiously. Move too quickly and you would immediately regret it and be out of breath. 45 minutes after reaching Stella’s Point, at 3:30pm Tanzania time, we made it to the summit. I felt such a sense of relief, elation, happiness, pride, and exuberance. Of course, they were all combined with physical exhaustion, but the positives far outweighed any negative effects my body was feeling and I allowed those emotions to flow freely. It was impossible not to cry. 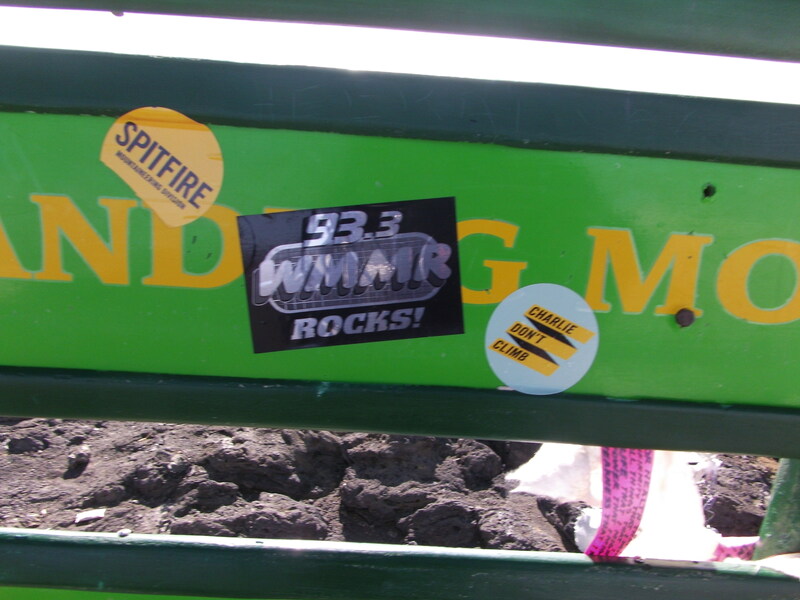 I called Matt Cord back at WMMR (thank you SatCom Global) and during the course of our brief conversation, broke down twice. I was completely and totally overwhelmed, but in the best way possible. The sad reality is that we only had a very short time at the summit. The air is too thin, the temperature is too low, and because we took so long getting there, the hour was getting to be too late. So at about 4pm, we began the 4,000-foot descent. As you can imagine, it takes a LOT less time getting down than it takes to get up, but you still have to be careful and not go too fast. Our party quickly became disjointed, with Carl, Lauren, and I in the lead pack with one of the assistant guides, Gaudence. Regan, Justin, Cathy, and Karma were behind us with Godlove. My knees hurt, especially my right one, but the three of us made it back into Base Camp in time to see the sunset. The trailing group made it back to camp about an hour later. We had gone a total of 8,000-plus feet, up and down, in a single day, and were exhausted, but were definitely in good spirits and proud of what we had accomplished. Together, we had a light dinner and then retired to our tents for one more night at high altitude. I popped 4 Advil PM, put in earplugs, and slept as well as one can when one is that high up and that cold. As I drifted off to sleep, I smiled, knowing that I had accomplished what I had set out to do. I guess I got what I wished for. Instead of spending tonight at Karanga Camp, then trekking to Barafu Camp tomorrow for a midnight ascent to the peak, we had lunch at Karanga Camp today, rested for 20 or 30 minutes, and then proceeded on to Barafu Camp, which is where we are as I type this entry. We’re over 15,000 feet, higher than any summit in the continental United States, and tomorrow, we wake up at 5am to begin the ascent to the summit at 6am. Uhuru Peak is at 19.340, which means 4,000 up and then, 4,000 back down to Barafu Camp, where we will spend tomorrow night, too. This morning, we woke up to chilly weather at Barranco Camp, but clear skies and great views of the summit. We began our trek out of camp and up the Barranco Wall on our way to Karanga. It was NOT easy going today. The Barranco Wall was very challenging, with lots of rock climbing and rock scrambling. From the top of the Wall, we had several ups and downs on our way to Karanga and the last descent, into the Karanga Valley, was wet and slippery, and the ascent after was steep. The benefit of not staying in Karanga Camp is that our Friday will be much easier. However, we still had to leave Karanga and make the long, slow, and steep ascent into Barafu where we are spending the night. The air is thin at 15,000 feet, and it is cold. We’ll be sleeping in some of our gear tonight: long underwear, gloves, and a hat, despite the fact that our sleeping bags are warm and the tents do a very good job at blocking the wind. Tomorrow, all we carry is our packs, our cameras, and our water. There’s no need to bring anything else. I am going to bring the satellite phone and attempt to call into the radio station from the summit. I was able to call Pierre this evening and check in with him. The signal seemed to be pretty strong and clear. So this is what we’ve been waiting for and training for and mentally preparing for: the climb to the top of Mount Kilimanjaro. The final ascent begins tomorrow at 6am! OK, so my attempts to “live blog” haven’t gone so well. I tried to hook up my computer to my satellite phone, but the connection never went through. So by the time you read this, I will most likely have already reached the summit. Today was a challenging day. If yesterday was a long, uphill hike through the rainforest, today was a climb up a mountain. We left the rain forest at 8:30 this morning and very quickly were in the heather. It was quite beautiful, with most of the trees draped in Spanish moss. But it was not easy. The ascent was much steeper and for the first time, we had to do some rock scrambling. Above the heather, we made it into the 3rd ecological zone, the moorland and proceeded on to our camp, Barranco Camp, at 13,000 feet. As we made it into camp, it was sleeting, our first precipitation. But tonight, there are no clouds and you can see an incredible night sky with tons and tons of stars. Tomorrow, we ascend the Barranco Wall and make our way to Karanga Camp. During this time, we will go up and down quite a bit and it might not be a terribly long day of hiking. However, our guide, Godlove, has proposed an alternative: if we feel ok at Karanga, we can continue on to Barafu Camp, spend tomorrow night there, and then make for the summit on Thursday instead of Friday. I am in favor of this plan, because it makes for a longer day tomorrow, but a much shorter day on Friday. The current plan has us beginning for the summit at midnight on Thursday, climbing through the night and into Friday morning, reaching the summit around dawn, and then descending 10,000 feet. It’d be a total of 14,000 feet, up and down, in one day. Regardless, we’ll know a lot more after lunch tomorrow. So far, things are going well and no matter what happens, the summit is not that far off! Of course, its sheer size and height were a little intimidating. For the first time, I was a little nervous. But then we reached the gate, gathered and organized all our gear, and began the hike from Umbwe Gate, at around 6,000 feet, up to Umbwe Cave Camp, at about 9,700 feet, and where I am writing this post. It’s almost 9pm, and this day was long, but it wasn’t overwhelmingly difficult. We hiked through rain forest, but the temperature was in the 60’s, we took our time, and we took plenty of breaks. The hike began at 11:25am and we reached camp at 5pm, going a total of 4 to 5 miles. A common phrase used by our guides is “Polé Polé” which means, “go slowly.” We remind ourselves that this isn’t a race, that we SHOULD take our time, and that this is just Day 1. Tomorrow, we get up around 6:30, have breakfast, re-organize our gear, and then hike for about the same amount of time to Barranco Camp, elevation approaching 13,000 feet. Polé Polé. Lastly, I was able to call in to Pierre’s show today using the satellite phone and hopefully, will be able to use the phone to post this blog, too. The connection hasn’t been great, but it keeps me connected to the outside world. And I must admit, it’s been refreshing not reaching into my pocket every other minute, checking for texts, emails, and calls. I miss my family and friends, but am having an amazing time! Thank you and hope to post again soon! Thanks for your patience. I’m back in civilization (the airport at Amsterdam) and can post everything I’ve written over the last week.